A quick 25 minute pedal up Tobins track brings you to the start of Murphy’s Run, a sweet, flowing grade 3 single track decent back down to the Arrow River. Great bang for the buck as a quick after-work ride. Great for dogs too with a mellow gradient and the river at the bottom for them to cool off in. A spicy grade 6 trail in the Skyline MTB trail network, rocks & roots & gnar galore! It’s also home to the infamous “Rollable as Bro” rock roll line. If you like steep & tech this is for you. 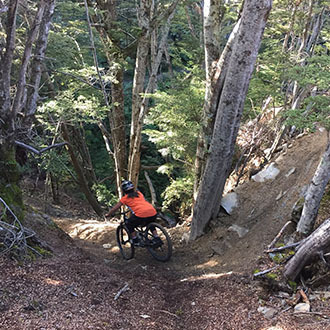 Probably Queenstown’s most famous (and must do) trail. Starting at the base of the Coronet Peak Ski Field & winding its way down to Skippers Saddle. 7kms long & full of flow & speed. Look for the phallic shaped rock on the drive up for how it got its name. 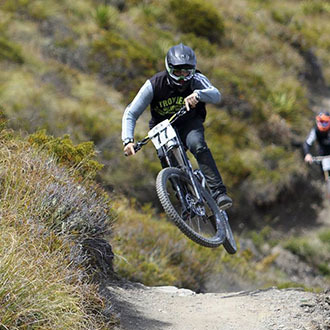 Huck Yeah is the big Jump line in the Skyline MTB trail network. If you want to let go & embrace your inner huck then this is for you. Intermediate & Advance take offs on each jump ranging from 20 to 55 feet in length. All are table-top style jumps so if you come up short & case you’ll only need a Lawyer, not a Doctor. My Number one, hands down favourite Queenstown trail. An amazing piece of dirt-art from the Queenstown Mountain Bike Club’s Wednesday-dig crew. 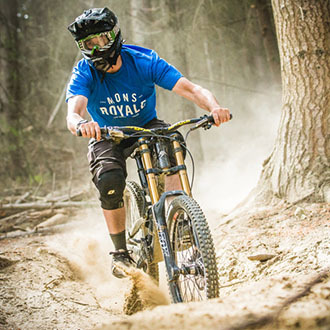 Winds its way down from the top of Fernhill Loop through some epic terrain & native forest. Tight & Technical, Rocks & Roots, and a healthy dose of exposure thrown in as well, Salmon Run has it all. Climb up the Beached As trail from the Skyline Gondola, then chill at the Mcgazza memorial table & take in the epic view before dropping in. Extra GNAR points on offer for riding it in the wet or at night during the depths of winter! And of course no Queenstown ride is complete without some après-ride at the local MTB bar; Atlas Beer Café on Steamer Wharf, more beers on tap than you can swing a stick at & the best steak in town!